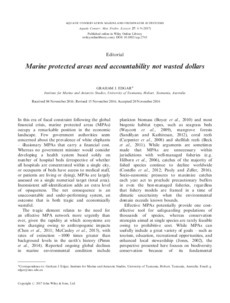 In this era of fiscal constraint following the global financial crisis, marine protected areas (MPAs) occupy a remarkable position in the economic landscape. Few government authorities seem concerned about the prevalence of white elephants – illusionary MPAs that carry a financial cost. Whereas no government minister would consider developing a health system based solely on number of hospital beds (irrespective of whether all hospitals are concentrated within a single city, or occupants of beds have access to medical staff, or patients are living or dying), MPAs are largely assessed on a single numerical target (total area). Inconsistent self-identification adds an extra level of opaqueness. The net consequence is an unaccountable and under-performing system, an outcome that is both tragic and economically wasteful.